First off, I want to tell everyone how much your encouraging comments have helped. I know I won’t be able to respond to each individually, but know I’m thankful and grateful to have such supportive people around me. Thanks for the reminder and for pulling me off the springboard to hermitland. I’m working on positive images and thoughts as that’s been the most challenging part in all of this and today was a step in the right direction. I got to sleep pretty late last night around 11:30pm and woke up early this morning around 4:15am to something rustling around in leaves not far from Ferris’s tent. Soon after, Blueberry Bear got up to use the bathroom so I figured it woke him up too. Problem was that I couldn’t get back to sleep so around 5am I gave in and did some emailing and then tried to sleep a bit, but it wasn’t happening. I still made myself wait and started hiking at 6:50am. Blueberry Bear and Ferris were up and sure to leave not long after me so I knew I’d see them in town. It was a nice downhill hike for 6mi to Atkins. The last couple of days I’ve been in touch with Chin Music who hiked the trail last year and is in the area for a month (from Illinois!) providing trail magic. He offered to pick me up at Atkins and drive me to pick up my resupply box and then have breakfast together. It was perfect! He met me right where the trail hit the highway and it turned out that my resupply box did not arrive at its intended location of the Comfort Inn. There was some slight worry until we found it at the post office. They saw AT Hiker written on the side and assumed it was addressed to general delivery. Good thing it wasn’t a Sunday! I was so fortunate to have Chin Music and his wife Sa there to drive me around the spread out town! 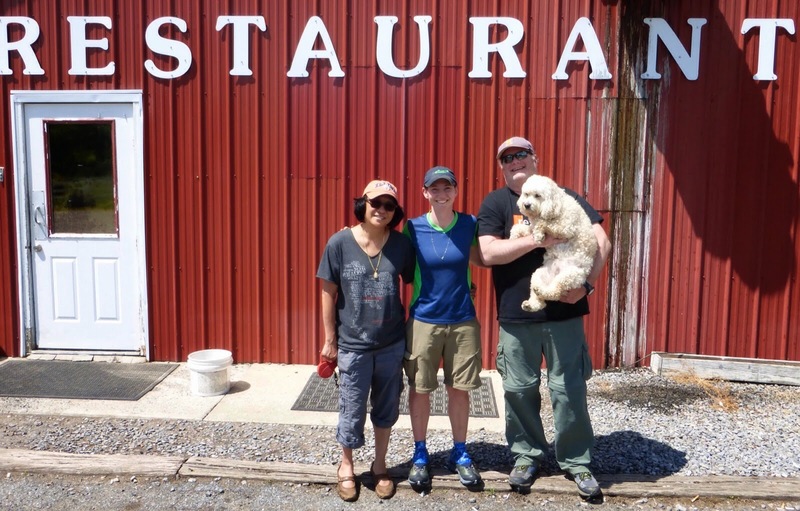 After finding my box, Chin Music and Sa treated me to breakfast at The Barn Restaurant which is right on the trail and where all the hikers stop for a bite to eat. It was a great breakfast which included a nice big glass of chocolate milk! Thank you Chin Music and Sa! Ferris and Blueberry Bear showed up and many other hikers were there that I haven’t met before. 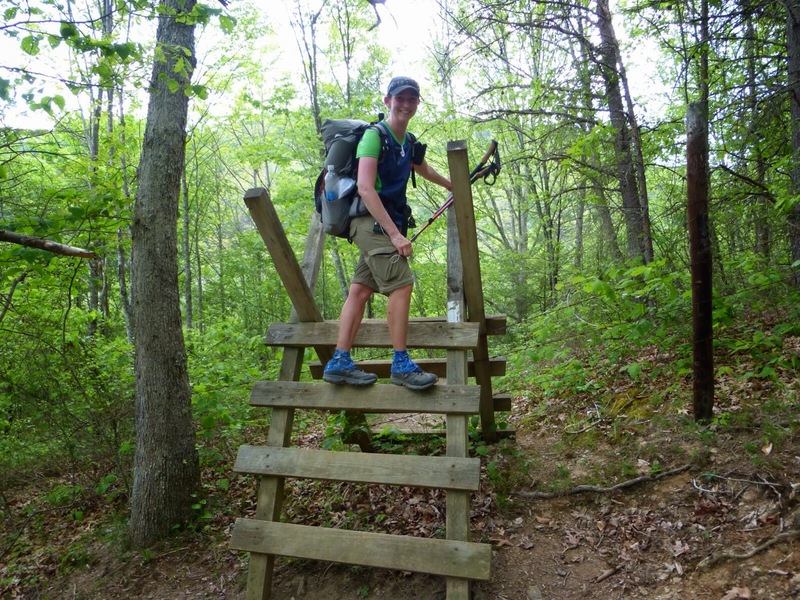 Chin Music had one of the most followed trail journals on the AT last year and it was fun because Blueberry Bear is a fan. I ended up staying in town for three hours before heading out just after noon. It was pretty hot and humid by that point. Today was a bit different scenery as the trail wound in and out of woods and then through private farmlands in which the trail wound through fields of grass. Notice the clouds that gathered and rumbled throughout the day. There were also many stiles to wind through and ladders to climb over. The fields, farms, cows, barbed wire, and views reminded me of the CDT at times. With the heat and humidity I was especially feeling my lack of sleep as the climbs were tiresome as I dripped sweat. The heat and humidity does seem to reduce my energy on the climbs because yesterday and today were the first times that I needed to pause to rest from fatigue on an uphill. 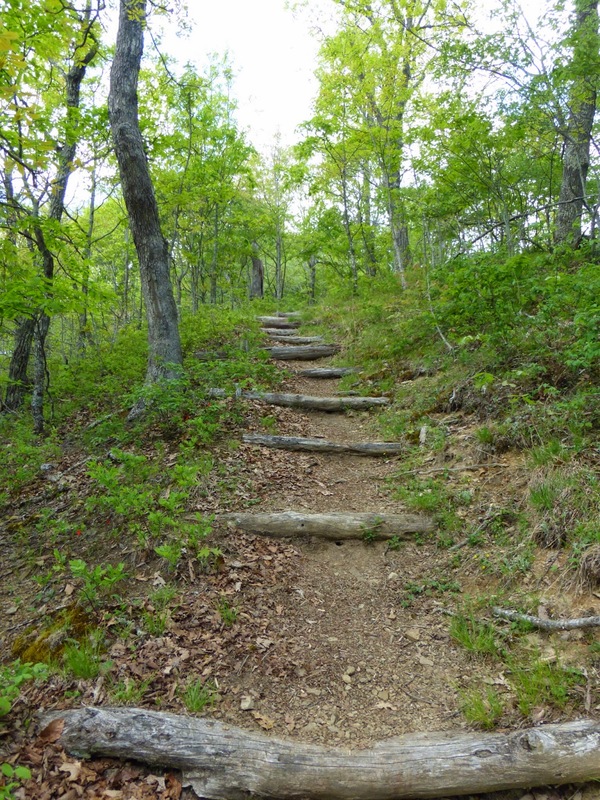 The worst ones for me are the ones with the log steps where it interrupts my stride, whew. There was a lot of up and down today in shorter spurts. The rhododendrons are blooming a bit more too and it’s nice to see the added splashes of color. At a stream, a group was gathered that had been at the restaurant and I saw pairs of them off and on all day. Two guys were military friends and really nice. I forget their names, but should see them more this week as they are camped a mile before me and are on a schedule to average about 25mi/day for the next week or two. 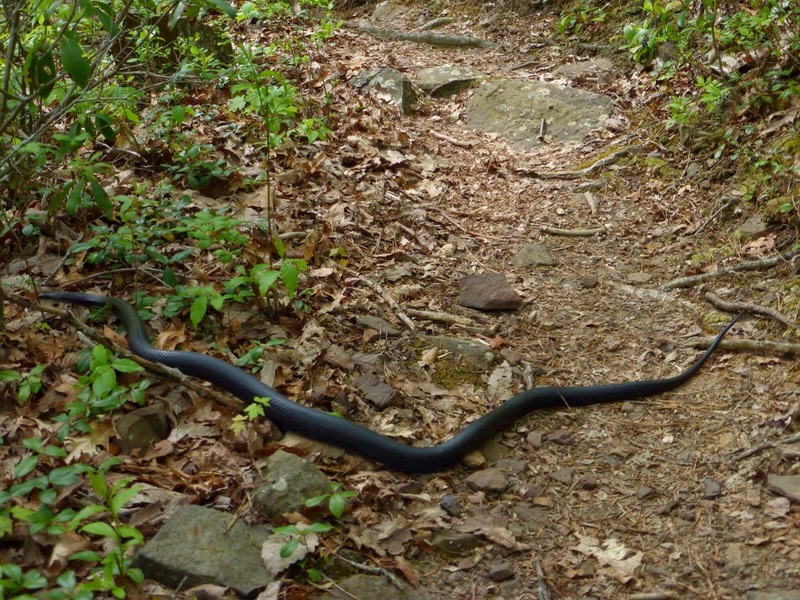 I did see another one of those frighteningly large black rat snakes and got a picture this time. It is at least four feet long. Chills. I ended the day hiking the last hour or so with a pair named Kenny and Tiptoe. We are camped at a spacious campsite along a stream. I really like it and we are able to spread out to opposite ends of the site where there is a fire ring at each end. Kenny and Tiptoe had a fire. Around 8pm, Ferris arrived now having camped with me three nights in a row! He had started the hike with a friend who has had difficulties and Ferris has been hiking solo since Damascus waiting for his friend to feel better. For the first time, he’s experiencing the freedom of hiking solo and he seems to really be loving it. Ferris has had fun seeing if he can make it to my camp spot each night and is very proud, as he should be! I haven’t camped with anyone two nights in a row out here and this is the third night in a row! Now we just need to get him up earlier so we might actually hike together. 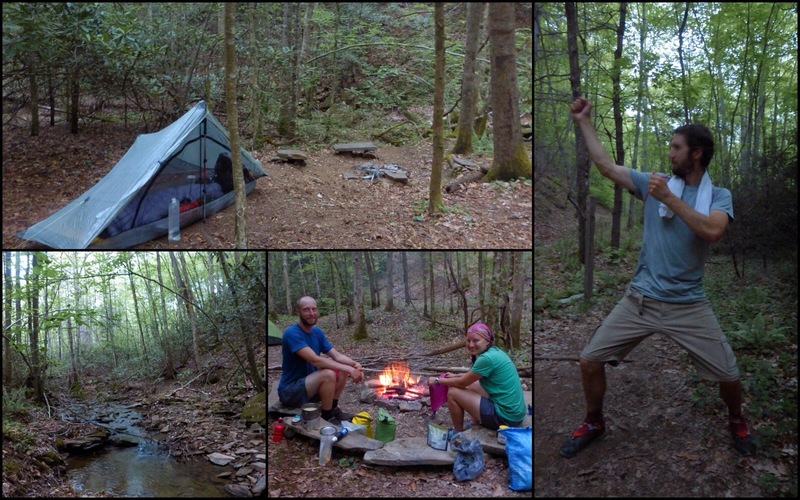 Here are my pictures from camp including Ferris celebrating his hiking freedom and slaying miles. Cracks me up. Thunderstorms and rain are possible the next three days. Thunder rumbled throughout the day and lightning started around 9pm tonight. It has passed for now and it is lightly raining. Tomorrow, it is expected to have a chance of isolated thunderstorms and the next day it’s supposed to get colder and rain hard all day. 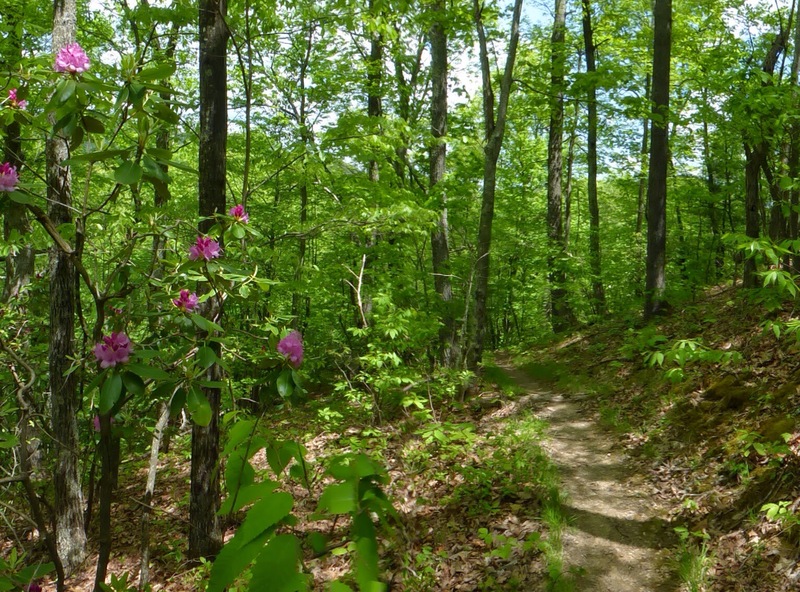 There is an opportunity to hike tomorrow to set us (Ferris and myself) up for an unplanned day in town if it does pour the next day, so I’m going to see how things develop tomorrow. It’s nice to have the option if needed. I’m tired and hope to sleep well tonight.